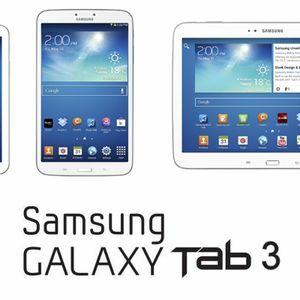 The Samsung Galaxy Tab 3, much like its predecessors, comes in three sizes, 7", 8" and 10". The 7" is powered by an Exonys 1.2GHz dual core processor, the 8" is powered by the Samsung Exonys 1.5GHz dual core processor and the 10.1" powered by a 1.6GHz dual core Atom processor. They run on 1GB, 1.5GB and 1GB of RAM respectively. The smaller of the 3 has 8GB of internal storage, while the 8" and 10" have 16GB of storage. All 3 can be expanded with a micro-SD card. The 7" and 10" have a 3MP camera and the 8" has a 5MP camera, and they all run on Samsung Touchwiz software.